A female white-tailed deer turns to look and sniff in the direction of a sound before bounding away through the woods. 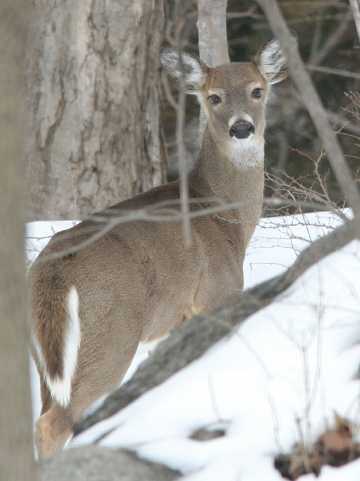 With the leaves down in late fall and winter, we’re more likely to glimpse the deer that live in Westborough’s woods. The days are also short now, so we’re especially likely to be up and about at the times when deer are most active – around dawn and the hours afterwards, and around sunset and the hours before. Throughout the year, we’re more likely to see evidence of our local native white-tailed deer (Odocoileus virginianus) than the deer themselves. They leave footprints – narrow, split heart shapes, 2 or 3 inches long, with the narrow end in front – in damp ground near streams, swamps, and ponds and along trails. If you know to look, you’re apt to spot these tracks surprisingly often. When snow covers the ground, tracks become easier to spot in other places, often crossing our human trails in the woods. Deer typically use their own deer trails quite regularly. There’s other evidence as well. As many homeowners know all too well, deer nibble twigs and tasty vegetation not only in the woods but also in our yards and gardens. Deer typically leave a torn, ragged-looking cut where they’ve munched a plant. The cuts look torn because deer don’t have upper front biting teeth, or incisors, as we do. In contrast, rabbits or woodchucks make a clean cut with their big front teeth. Other clues that deer are around include occasional small saplings with bark rubbed off a few feet above the ground. These “rubs” are places where a male – a buck – has rubbed his antlers against the tree, leaving his mark and his scent for other deer – females and rival males – to notice. Bucks grow antlers every year for the fall mating season and then shed them during the winter. Another sign of deer is a small pile of pellet-like deer droppings in an area where deer have been feeding. And sometimes, you can see flattened grass in a field or oval depressions in the snow in the woods, where deer have rested or bedded down. If you catch sight of a white-tailed deer while you’re walking Westborough’s trails, chances are you’ll see the reason for its name. As it bounds away, it raises its tail in alarm, flashing the white underside. If you happen to see a small group of deer, especially at this time of year, it’s likely to be a female – a doe – and her offspring. The family group would typically include her grown fawns from the spring, as well as the yearlings – especially females – from the previous spring. Bucks are far more solitary, but they may form small groups for short periods. With keen eyesight and hearing, and an even better sense of smell, deer are very difficult to approach or even to sneak up on. Their senses alert them to danger and to other deer. With their eyes on the sides of the head, in a position that’s typical in prey animals, they can see behind them and in front of them on both sides. They may also be able to see in ultraviolet light, helping them to get around at dusk and dawn. Their large ears, half as long as their head, catch the slightest sounds. The scent of other animals travels on the air to their nostrils, making them aware of who’s who at a distance. They also leave their own scent in the environment, from scent glands on their heads, on their legs, and in the split between the two halves of their hooves. If you could peer through the brush at a group of deer at rest, perhaps during the middle of the day, you might be surprised to see them chewing their cud. Most of us know that cows chew their cud, but deer do, too. Like cows, deer have “four stomachs” – in reality, a stomach with four chambers. This arrangement allows deer to digest all sorts of vegetable food that we can’t, from grass to acorns to mushrooms that are poisonous to us. The chambers act as fermentation vats. They’re filled with bacteria that produce enzymes that digest the cellulose that we can’t digest in plants. (For us, it’s fiber in our diets.) Without the bacteria, deer (and cows) couldn’t digest it either. With their four-chambered stomachs, deer can go out in the open and eat a lot of food quickly and then digest it later in the safety of cover. They fill the first two chambers, and then, when they rest, they bring the food up again, chew it thoroughly, and swallow it again for further digestion. How do deer fare in the winter? Food is scarcer, and we tend to see them at our ornamental shrubs. But deer are equipped to survive New England winters. Deer tend to eat 30% less and conserve energy by becoming 50% less active in winter. They may take shelter in groups under evergreen trees, where less snow piles up. And their winter coats, which are grayer than their reddish summer coats, have long, hollow hairs that insulate them from the cold. We’re more likely to see deer these days than in past decades. Massachusetts now has as many or more white-tailed deer than it had when Europeans first set foot here, according to wildlife experts. Between then and now, deer in Massachusetts dwindled to a few small populations in the Berkshires and on Cape Cod, in the early 1900s. Their numbers have since recovered. The state’s deer number now between 85,000 and 95,000. What happened? Native Americans had apparently kept the landscape suitable for deer by regularly burning portions of it, keeping some areas of the forest relatively open. When European settlers arrived, they promptly started clearing land for farming, removing the forests that deer need for cover. The settlers also did a lot of hunting, and by around 1700 – even before Westborough was incorporated in 1717 – the colony began to prohibit hunting during part of the year. Deer largely disappeared from much of Massachusetts over the next 200 years. Then, in the 20th century, farming decreased steadily and forests began to grow back in the abandoned fields that we now see marked by the old stonewalls that crisscross the woods. Hunting also became more regulated. Deer can increase their numbers quickly. Those of us who grew up on Bambi stories tend to think of one fawn per mother, but adult females typically give birth to two fawns. With plenty of food and few losses to predators, deer can double their number in six years or less. In recent decades, development of the sort that Westborough has seen over the past 30 years has created lots of “edges” between woods and open areas, dramatically increasing just the kind of landscape that deer like. They need open areas where they can feed and wooded areas where they can take shelter. Westborough has some of their few natural predators, namely coyotes and dogs. Lovely as they are to look at, living with deer can have its downside. Besides eating our ornamental plants and gardens, deer can pose a hazard on the roads. According to the Westborough police department, so far 20 collisions between deer and vehicles have taken place in town in 2007. Another concern is Lyme disease, caused in humans – but not in deer – by bacteria (Borrelia burgdorferi) carried by tiny deer ticks (Ixodes dammini). The adult ticks are about the size of a sesame seed and feed mainly on deer, while their immature stages are about the size of a poppy seed and feed mainly on white-footed mice (Peromyscus leucopus) These mice live in the same “edge” environment that deer like. All stages of the tick can attack humans. What’s a person to do? Deer netting and deer spray can help to protect plantings. See the recipe for a favorite homemade deer spray from a part of Connecticut that’s overrun with deer. You might also consider planting shrubs and perennials that deer tend to avoid eating. See the list of deer-resistant plants (native to North America) from the New England Wild Flower Society. To guard against ticks when you’re walking or working outdoors, wear light colors (to make it easy to spot ticks) and long sleeves and pants, and tuck pant legs into socks. Carefully check yourself and children for ticks after going in the woods or areas with deer. Remove any ticks immediately. Infected deer ticks generally need to be attached for at least 24 hours to transmit the Lyme disease bacteria. On a larger scale, the Massachusetts Division of Fisheries and Wildlife aims to control the number of deer by adjusting the hunting season and the numbers and kinds of deer that hunters can take. The state is divided into 15 wildlife management zones (WMZ), and the archery, shotgun, and muzzleloader hunting seasons and bag limits are set individually for each zone. (Westborough is in zone 9.) The goal is to keep the density of deer between 10 and 30 per square mile. Westborough has three areas with trails where hunting is allowed, according to Don Burn, chair of the Westborough Community Land Trust’s stewardship committee. They are: land behind St. Luke’s Cemetery, the Wile Forest, and the Westboro Wildlife Management Area. Elsewhere in town, hunting is only allowed on land only with the written permission of the owner. No hunting is allowed in Massachusetts on Sundays. Blend well. It should foam up nicely. Add 1 Tablespoon hot sauce (such as Tabasco). Store in refrigerator (because of the egg) in a labeled gallon jug. Put some in a spray bottle and spray on foliage to protect plants outdoors. Repeat every couple of weeks, or after a heavy rain, or on new foliage that grows. If spraying is done at the beginning of the growing season, deer will learn to avoid the plants that have been sprayed, so it won't be necessary to spray much later in the season. Here are some native plants for varied soils and light conditions that perform in the garden, but are browse resistant.